Sign solutions for over 20 years. Signs ink was established in 1989 by the Beachak Brothers. Our Mission has always been to provide our customers with products & services of the highest quality and the greatest possible value. We provide custom signs, sign service, awnings, vehicle lettering and truck wraps for businesses in the Tri-State Area. We can design, manufacture, install and maintain an identification package tailored to your needs. We also provide a full range of sign services. Whether or not we installed your current sign, we can maintain it, make repairs, replace lights, etc. Our in-house design team can design everything you need for your businesses signage needs - from designing an original logo - to implementing it on your signs, vehicles and instore signage. 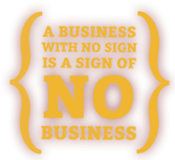 Signs Ink stands ready to deliver excellence for you and your business. After all - that's what our legacy has been built on - for over two decades of service.